These are huge. No, really. I’m told by my husband and some friends who are whoopie pie aficionados that they’re exactly the right size, but I can’t imagine that this is correct information. So what I’m saying, I suppose, is: If you want big, impressive whoopie pies, make the recipe exactly as printed. If you’d like to try to get a number of smaller, daintier whoopie pies, spoon the batter out in about 2-tablespoon increments and cut the baking time to an even 10 minutes. Preheat your oven to 375 degrees. Lightly grease or line with parchment three baking sheets. In a large bowl, beat the softened butter, sugar, and molasses until smooth and fluffy. Add the eggs and mix well. In a second bowl, combine the flour, cocoa powder, baking soda, cinnamon, ginger, nutmeg, allspice, and cloves. Gradually add a third of the dry ingredients to the wet, beating just until combined; then add half of the hot water and mix well. Repeat until you’ve incorporated all of the hot water and dry ingredients. Gently fold in the chocolate chips. 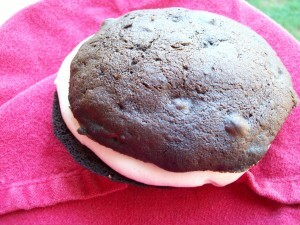 Using a 1/4 cup measure, scoop out the whoopie pie batter into mounds on the prepared baking sheets. Leave a generous amount of room between them; I find that I can fit six on a sheet, at maximum. Bake the whoopie pies at 375 degrees for 15-20 minutes, just until they’re set and a toothpick inserted into the centers comes out clean. Remove the whoopie pies to a cooling rack and allow them to cool completely before filling. Using an electric mixer, beat the cream cheese, butter, and condensed milk at medium-high speed until smooth and fluffy. Add the cinnamon, vanilla, and salt and combine. Gradually add confectioner’s sugar until you’ve achieved the desired consistency: Thick and smooth, but not stiff. Chill the filling for at least 30 minutes before filling the whoopie pies to allow the filling to firm up and set. To fill the whoopie pies, dollop a generous mound of filling — about 1/4 cup — onto the flat sides of half of the cooled cakes, leaving a border around the edge. Sandwich with another cake and let the filling spread out to the edges. You may end up with a small amount of filling leftover; if that’s the case, refrigerate it and use it to frost cupcakes, or thin it with milk and use it as a glaze for muffins, pancakes, or homemade donuts.